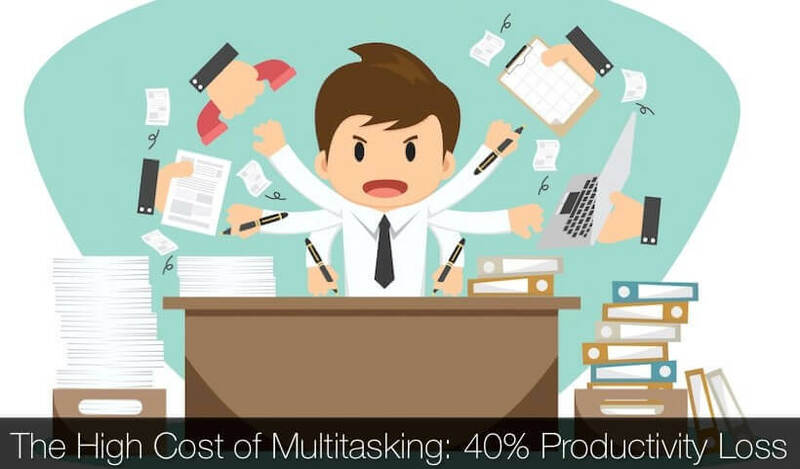 40% of Productivity Gets Lost by Multitasking. How to Avoid It? Home > Marketing and Productivity > 40% of Productivity Gets Lost by Multitasking. How to Avoid It? With the increasing pressure to perform your best and always be at the top, no matter what the cost – gives rise to the tendency of multitasking, be it in modern offices, or a very competitive college course or the rat race among students to come out as best of the lot. Even though it feels like one gets a lot of work done while multitasking, juggling one important duty with another and sometimes simultaneously, it ultimately results in outcomes that are always below the superior expectations of both the worker and the preceptor. And why not? It is very obvious that a project which has been done with absolute focus on part of the worker will yield a better result than a fleeting bout of concentration followed by the anxiety to finish it within a shorter amount of stipulated time, while at the back of the mind, a completely different thought process goes on regarding the complimentary task. Even though multitasking could sometimes seem like the solution to a lot of problems especially under high-pressure conditions, it is not – on the contrary, itself is a growing problem spreading as an epidemic in the dog-eat-dog world of modern corporate life. It does not increase productivity no matter what it might look like at face-value. As we multitask, we actually force ourselves to work on overdrive, while our brain switches gear almost in a superhuman manner trying to fulfill our dual duties somehow within a stringently stipulated amount of time, giving no heed to the quality of the work that ensues. And as a result, no matter the effort you put in, the end productivity always gets hampered, rendering your best efforts a moot point in the grander scheme of things. Although it is not possible to absolutely let go of multitasking when it comes to the daily grind, the understanding of how it hampers our productivity by an estimated 40% would perhaps help to nullify the negative effects of it. Every one of us has done this one time or the other. Examples include answering texts while working or taking calls while driving. While working on a project, it sometimes occurs in happenstance that another is thrown our way that needs more urgent attention at that precise moment. This results in rapid shifting of concentration from one specific job to another, without finishing up in the first. This might not feel like multitasking per se, but the rapid succession of one task immediately after another result in the brain switching its gears very fast, without getting the proper rest to work off the mental fatigue and renew efficiency. Discerning the tendencies of multitasking among the new crop of results-driven humans does not necessarily mean that any one of them has worse effects than the other, but all three are equal evils to the ability of the human mind to exercise their full capacity as a whole. Research indicates that only about 2% of the whole population of the world are proficient in multitasking, and this 2 % are the least likely ones to multitask. A lot of us have the perception that somehow we are part of the elusive elite 2%, but the irony lies in the fact that those who think that they can multitask with efficiency, are often the worst at it. Most people who multitask follow the third tendency, i.e, rapidly jumping from one task to another with minimal switch breaks in between. When the amount of work to be completed within a certain time is less, the switch cost is relatively less than when you have a heap load of work to be finished within a certain deadline. This repeated switches between different tasks cause a back-and-forth current resulting in brief mental blocks hampering work productivity by up to 40% of someone’s usable time. Thus, even though multitasking looks to be time-saving and efficient on the surface, it actually ends up costing more time and reduced quality of end-product. Being approach-oriented or focussed on results. Somehow being convinced that they are a part of the 2 percent. Have major concentration trouble. It is okay to be one of these people, and it is obviously not a reason to despair over! All you need to know is, almost everyone surrounding you has fallen prey to the negative aspects of multitasking one way or the other. And it is not something that goes away in a day – it requires the strategic division of labor in the following ways. Identify and segregate complex tasks: At the beginning of your day, divide your tasks according to the difficulty level and assign a certain time of the day to work upon them. The APA says that any complex or unfamiliar task means more switching times lost while multitasking. If you separate a certain time for the new and difficult tasks, you will end up saving a lot of brainpower and productive time as well. 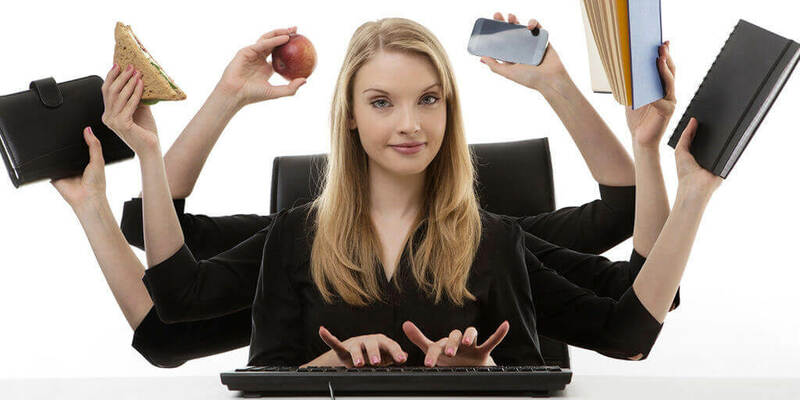 Use your multitasking abilities with familiar tasks: Now that we have sorted the situation for new and complex tasks, we come to the familiar and repetitive tasks that do not result in loss of much switching time or brainpower. When you are in a situation the requires multitasking with these jobs, let yourself indulge in the tendency a bit. It will be helpful in deterring your multitasking tendency in cases of complex tasks that require your full focus and understanding.